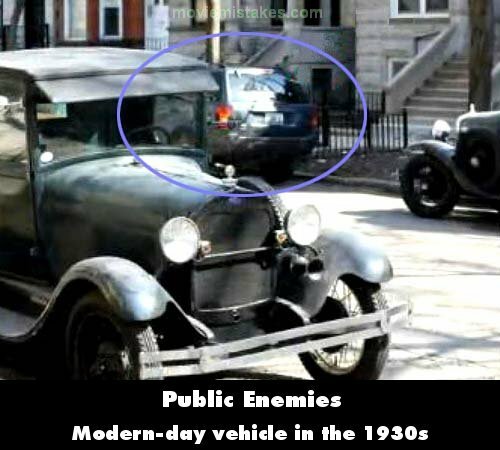 Factual error: In one scene, focused on a period wood-staked pickup truck parked on the street, you can see clearly a modern Jeep Grand Cherokee parked on the other side of the street. Continuity mistake: During the scene of the fight between Dillinger, and Melvin Purvis and the Little Bohemia Lodge, it shows Purvis shooting from the side and he has a straight magazine in his Thompson, but when the shot faces him he has a drum magazine in his Thompson, but when it goes back to his side to reload, he again has the straight magazine. 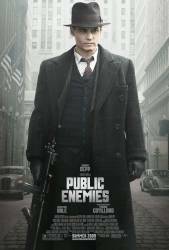 Revealing mistake: After a shootout with Baby Face Nelson at a hotel, Melvin Purvis converses with J. Edgar Hoover over the telephone. As he says, "Our type cannot get the job done." Watch the background. You can see a modern era train move along the tracks in the darkness. This is inconsistent with the film's setting of 1933/1934. Factual error: The "Swing" music on the soundtrack wasn't recorded by anyone till late 1935 or later, when Swing began. A good year after Dillinger's death. Factual error: "Love Me Or Leave Me" by Billie Holiday, which is supposedly coming from the radio in 1934, wasn't even recorded by Holiday until 1941. Continuity mistake: When Dillinger is looking at his watch just before going to the movies, the time is 6:02. Close-up of his mum's photo, and the time is now something like 6:25. Continuity mistake: When Dillinger is being flown back to Indiana he has a moustache. As he is leaving the plane, the moustache is gone. Factual error: The film is set in the 1930s, but when there is a closeup of a sheet of text (a conversation between Billie and John), it is typed out in a computer font (which did not exist) as opposed to a typewriter. Revealing mistake: In an aerial shot of Lincoln Ave in Chicago outside the Biograph Theater the rubber mats laid on the road to look like 1930's brick streets only cover the middle 1/3rd of the street. On the outside 2/3s the street is modern asphalt and shows striping tape for bike lanes. Revealing mistake: Just after the Little Bohemia scene when Melvin Purvis is shooting Baby Face Nelson, you can see a whole bunch of flashes going off in Nelson's jacket, which are obviously charges going off. Factual error: When Purvis is outside Billie's apartment, looking at the transcript of her phone conversation with Dillinger, the page is from a printed word processor, not typed out on a typewriter. Factual error: When Special Agent Winstead is leaning over Dillinger to hear what his last words are, you can see that he's wearing modern-day contact lenses, in 1934. Factual error: During the movie Dillinger talks with Baby-Face Nelson about a train job. The train is visible in the background. The train however is the Union Pacific locomotive 844. This locomotive was not built and delivered to the Union Pacific until December 1944, 10 years after Dillinger was killed. Factual error: The distinctive console radio airplane style Zenith Black Dial wasn't manufactured till 1936, one year after Dillinger died, yet it appears several times in the film during 1934. Revealing mistake: In the scene where Dillinger breaks out of jail in Indiana, there is a shot of the getaway car and its license plate, and you can see that the license plate says "Historic Vehicle" on it. Continuity mistake: When Depp is in the cinema, with the audience looking left and right without seeing him, in a wider shot he's worried, then slowly breaks into a wry smile. We then cut to a closer shot, and he's suddenly looking serious again, before smiling once more. Factual error: The Western Electric Model 639A microphone prominently featured in front of J Edgar Hoover in the 1934 Washington DC Senate appropriation hearing scene, wasn't invented till late 1939.